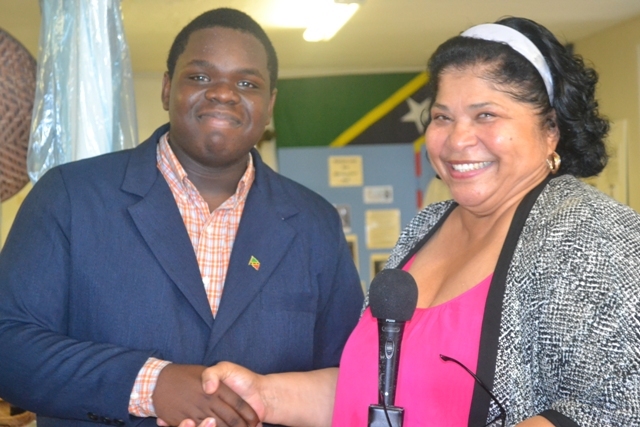 NIA CHARLESTOWN NEVIS (August 07, 2015) — Fifteen-year-old Gingerland Secondary School Student Rol-J Williams was given a memorable send off by the Nevis Historical and Conservation Society (NHCS) at their office in Charlestown on Wednesday August 05, 2015, before his departure to Vermont, USA, to represent St. Kitts and Nevis at the United States Government and World Learning 2015 Youth Ambassadors Program for Brazil, Argentina, Chile, the Caribbean and the United States. During the brief ceremony, Executive Director of the NHCS Evelyn Henville explained that the teenager was selected after the Society submitted two applications to the US Office in Barbados, to participate in the three-week programme by the US Government and the World Learning Centre. On his return, he is expected to implement a project to assist one of two communities showing what the programme meant to him. According to Henville, the Programme is designed to promote mutual understanding between the people of the United States, South America and the Caribbean; prepare youth leaders to become responsible citizens and contributing members of their respective communities; influence the attitudes of the leaders of a new generation; foster relationships among youth of different ethnic, religious and national groups and to create networks of hemispheric youth leaders both within the participating countries and internationally. She said it was the first time St. Kitts and Nevis was selected to participate in the programme and was pleased Williams was selected to represent St. Kitts and Nevis. The other participating islands in the Caribbean included Antigua and Barbuda, Barbados, Dominica, St. Lucia, and St. Vincent and the Grenadines, Guyana, Jamaica, Suriname and Trinidad and Tobago. Meantime, Premier of Nevis Hon. Vance Amory, who attended the ceremony, said he was pleased to participate in the send-off ceremony. He applauded Williams for the ambassadorial role he has taken on for Nevis over the years and registered his appreciation. 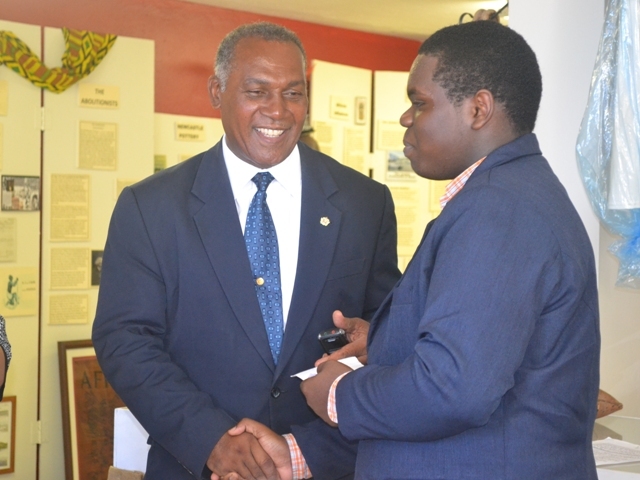 Mr. Amory told Williams he considered him as a good role model to the young people of Nevis and the impact he makes in Vermont would have a positive spin off effect for his peers. “If you conduct yourself well, as I expect you will, and you can demonstrate you are capable, you are disciplined, that you have the best interest of the world community, not just your own community but the world community at heart… if you demonstrate that you are a person of value, a person who has the attributes to be a leader…a community leader, a teacher, whatever it is you aspire to become, then I can almost say to you without a doubt, that this can open doors for yourself and for those who are here in this country, whom you can then advice [and] influence to follow in your footsteps,” he said. Mr. Amory told Williams, the training programme offered him a golden opportunity to do well for himself, to feel the benefits of what the outer world is like and to really show his worthiness of being selected to represent St. Kitts and Nevis as a youth ambassador. He also urged him to enjoy both the business and social side of the programme and was certain he would know how to conduct himself. He said based on his curriculum vitae he has a sense of appropriateness and discipline, both attributes that would benefit him and the young and older people he represents. Mr. Amory presented Williams with a monetary token from the Board of Directors of the NHCS and staff to ensure all aspects of his travels are satisfied. In response, Williams expressed gratitude for the opportunity to represent St. Kitts Nevis and the wider Caribbean.